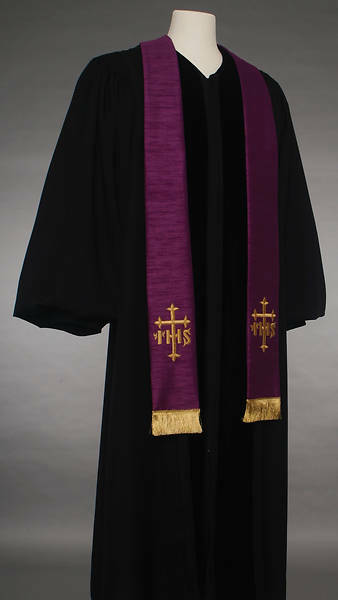 This new stole brings ornate styling previously unobtainable in this price range. Made of a Polyester/Rayon/Silk blend this stole features a duponi silk texture on the base fabric with gold embroidered IHS symbols and Latin crosses on each panel with matching fringe at the bottom. Also has an embroidered cross at base of the neck. 90" long. 3” wide at the top and 4.5” at the bottom. Dry clean only. Also available in green, white , and red.